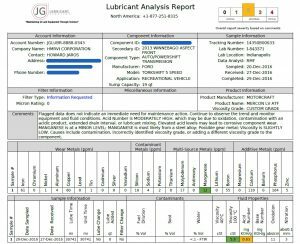 What do I mean by engine oil analysis? It is the process of removing a small sample of the engine oil and sending it off to a lab for a very comprehensive analysis of the oil. It is not an invasive procedure, however, due to complications that can occur in the fluid draw process, it is best left to a certified NRVIA RV inspector when doing a pre-purchase evaluation. The certified RV inspector can offer advice on the process, perform the analysis as well as clarify the results once the sample is analyzed. So, what can fluid analysis tell you about the RV you are thinking of purchasing? Motorized RV’s have an engine, transmission, and a generator. Each of these components is expensive if repairs or replacement are needed after the sale. You want to know about the condition of these components before purchase! High-end class A RV’s have generators that have cooling systems because they are generating the equivalent of up to 100 amps to provide for the needs of the RV. In our RV inspection business, we see a trend in that most RV owners with these types of generators seem to ignore the coolant system. 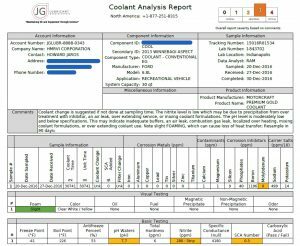 We find low coolant levels and out-dated coolant. Results from the lab have indicated a variety of issues needing attention. Shrewd RV buyers address these issues before taking possession of the RV. In all, there are three types of oil being used in the RV and up to two different types of coolant protecting the motorized components. Should you follow the manufacturer’s recommendations about fluid interval changes? Are they too conservative or could the service intervals be extended? How do you know based on how you will use the RV? Our most recent experience with an RV inspection client proved that without engine oil and other fluids analysis the client would have purchased a money pit. 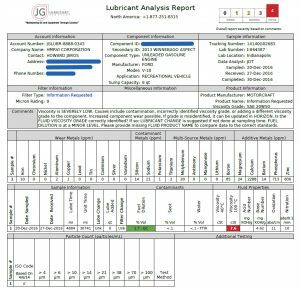 The oil and coolant analysis reports received back from the lab were concerning enough that the client walked away from the purchase. Had they bought the class A RV, they would have had to sink a lot of extra money into it based on the lab reports on both the engine oil analysis and the coolant analysis results. That plus the other issues that we identified in the RV inspection process saved our client from what could have been a bad buying decision. Everything that was identified could have been repaired, but our client chose not to go that route. They were not interested in buying a hobby! Be Sure to do an Engine Oil Analysis for an RV on the Ford E450 Chassis! Pam and I purchased our current full time RV home back in February of 2015. At that time it had 17,000 miles on it and records indicated meticulous service intervals. We are now at around 32,000 miles. Just a few months ago, with 5,000 miles on the engine oil, I pulled a sample of the engine oil, the engine coolant, and the transmission oil. Needless to say, for a vehicle that is a 2013 on the Ford E450 chassis, with the V10 Triton engine, I was a little horrified! I had an abnormal rating on the coolant and a critical rating on the engine oil. Because Pam and I have been on the road a fair bit, I put off sampling my RV thinking that given it’s lower mileage that everything should be okay. It’s kind of like the doctor not going to the doctor. After receiving the engine oil analysis, I scheduled an oil change at a Ford dealership as we were passing through Pensacola, Florida. I advised the service technician of the results I got back from the lab with the engine oil that had a service interval of 4,884 miles. The Ford dealerships recommend the 5w-20 Motorcraft product in these vehicles. That is what I have been using. After speaking with the service technician, he recommended that I switch over to a Mobile One synthetic blend, given the way I use my RV. Given the results of the engine coolant, I also had the dealership flush the system and replace the coolant. Your analysis came back good, and there’s no need for maintenance at this time. So, don’t change the fluid and never add or introduce any aftermarket supplementary products to the fluid. These products are “fully formulated” to have all the properties they need to work properly. Fluid life is determined by changes in viscosity, oxidation resistance, and contamination. My recommendation is to check the ATF (automatic transmission fluid) again at either 12 months or 6 months if you’d feel a little more comfortable doing the more frequent six-month check to monitor the fluid properties and contaminants. Viscosity – The product data sheet shows that the product should have a 100C viscosity of 6.0 cSt and your 100C viscosity measured 5.9 cSt. So, it’s not degraded from a viscosity standpoint. If the viscosity were to be too low, the transmission wear metals would reflect that, and the iron, copper, lead, aluminum, and tin would be expected to be higher than they currently measure. Oxidation – The oxidation resistance (oxidation state) of your fluid is good. Oxidation resistance (resistance to thermal stresses) in ATFs (Automatic Transmission Fluids) is typically very good and typically not the determining factor in ATF fluid life. Oxidation resistance is measured by the TAN (Total Acid Number) result. It’s not considered critical until it goes up to around 1.5 or 2.0. So, in your case, the fluid has not seen excessive heat. This is all very typical of modern-day ATFs. Contamination – The other thing we check for is contamination. And, your fluid checked out good. We would normally be concerned if sodium and/or potassium were elevated because that would indicate engine coolant bleeding into the transmission cooling circuit. Coolant in transmission fluid acts as a solvent which can attack the adhesive (bonding material) that holds the friction “cookie” to the steel clutch plates. We also would be concerned to see excessive water (more than 0.1% or around 1000 ppm). Yours measures < 0.1%, so there’s no water, which is typical. 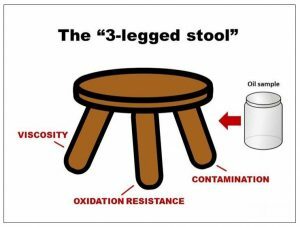 Tom uses the analogy of the three-legged stool to visualize the importance of viscosity, oxidation, and contamination when it comes to evaluating engine oils. If one of the three legs is weak, the stool will fall. Same with fluid analysis and the measurements of viscosity, oxidation, and contamination. If anyone of them is out if range then the fluid needs to be replaced. So, for my Ford E450 RV chassis, the oil and coolant failed and were replaced, and the transmission fluid will be monitored on a six-month basis to see what future results reveal. Test the Engine Oil Before You Buy that RV! Can you see the importance of fluid analysis when it comes to purchasing a motorized RV? How about testing the fluids on a used truck before purchasing it to tow a towable RV? Can you do this yourself? Sure! You can purchase fluid kits and perform your own analysis. Most technically-minded RV owners can do this on their own RVs! When it comes to a pre-purchase evaluation, the owner of the RV, whether a dealership or an individual, will want an insured professional to perform this service, someone like an NRVIA certified RV inspector.